Humanoid soccer has seen impressive progress in recent years. 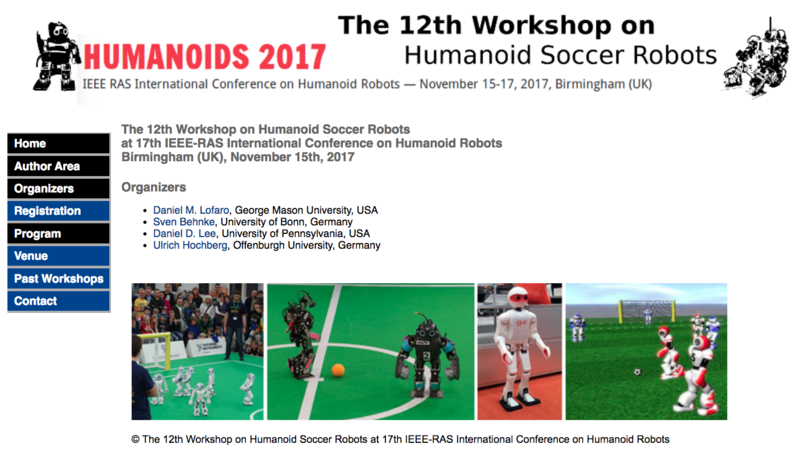 Bipedal standard or open platforms (Nao, DARwIn-OP, NimbRo-OP) make soccer robots accessible to many research groups, advanced 3D simulation games make the investigation of team play with complex humanoid robots possible, and soccer games for larger robots are a step towards playing with humans. The ultimate goal of this initiative is to develop a team of humanoid soccer players – i.e. robots with human-like awareness of the game situation, motion skills, and cooperation abilities. This poses a unique set of challenges to robotics, AI, and other fields. The workshop aims at bringing together researchers from the RoboCup and FIRA communities, as well as other researchers interested in the subject. All contributed presentations are subject to a peer review process. We solicit submissions of original, previously unpublished research papers, optionally accompanied by a video. Papers should be up to 6 pages in length, formatted according to IEEE conference layout (two-column). Accepted papers and videos will be available online. The number of pages is limited to six, including figures. If you want to add a video to your submission, please include a link for video download in the paper. If you don’t have an EasyChair account, you will need to create one.